Too big for the Grip-n-Gulp? Too small for the Nalgene's On The Fly? Try this on for size! Nalgene has taken their 12 ounce bottle and paired it with the leak proof On the Fly Cap in this kid sized water bottle. They have also made the silicone stopper a little softer so it is easier for little ones to push closed. I purchased this for my 5 year old daughter. She complains that it is difficult to close and that it leaks even after she hears it click closed. I have seen no evidence of it leaking....:) I like the size of it. She likes how easy it is to drink from. This is the third time I'm buying this bottle. Although the clip part can be a bit hard for toddlers, once they learn how to do it, no leaking, sturdy, perfect for preschool. I bought this bottle in july, and my 4 year old loved it. It took her a bit to master the clip on the front but once she got it it became her favourite bottle. The only reason i am giving it 2 stars is because the plastic that holds the side of the metal clip on the bottle broke a couple weeks ago and now cant be closed securely. My 4 year old has this one and she loves it. She is a big fan of the design and enjoys opening and closing the lid. I like the option of the lock. Sometimes she does need help opening and closing it but it really isn't for young kids- My 2 year old has the spout cap and it is much more suited to young kids. Not for young kids. Cap hard to close and open. The nose is just a big hole so the minute you tip the bottle when open it empty it self. Fantastic water bottle. Love the fact that it has a lock closure as well as a snap closure. Definitely leak proof. Great for small hands and grips and comfort is excellent in design. Excellent for school lunches or road trips or afterschool activities. Dishwasher safe is a bonus as well! These bottles are great for school lunches. Our 4-year-old can work the latch by herself after I showed her how to do so. I've noticed that the bottles do tip over easily when nearly empty with the spout open; however, despite this, the small amount of liquid inside miraculously doesn't spill, due to the clever placement of the spout hole. Durable, no leaks, dishwasher safe - great product! We bought three. I got this bottle for my seven year old, and she loves it! It's a great size, light, strong, leak-proof, and she can fill it up on her own. I ended up buying another bottle because this was such a hit. 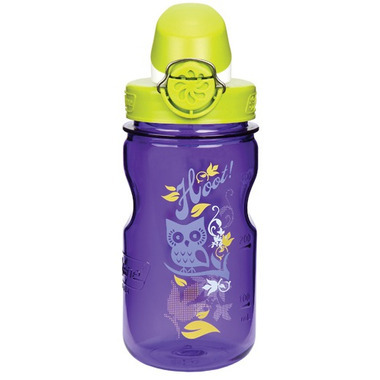 Great bottle- my daughter uses it everyday in JK and has no problem opening and closing it. So far no leaks. Great bottles! I bought 3 for my 3 kids. They're the perfect size for in their lunch bag for school. So far after a few weeks no leaks. Got this for my 5 year old for school this September. She likes it a lot so we're getting another but wish they have it in pink, we love pink. Really good water bottle. Gone through a lot of the cheaper water bottles, my 15 year old never complained, so I didn't think to try a different bottle but when my little girl starts school I was kind of concerned about her opening and closing the cap, so looked for a different bottle that looks easier to open and close and saw Nalgene, yes way better on the quality part and functionality. As soon as we took it out of the package my little one figured how to open and close the bottle, no need for tutorial, yes! My five year old takes this bottle to school with her every day. She loves that it is really cute. My one complaint is that it is really tricky to close. Perhaps we got a dud or something, but even I have a hard time closing the lid. If it wasn't for the metal clasp to secure it, we wouldn't be able to use it at all. When it is closed properly though, it doesn't leak at all. Excellent product! Bought this for my 5 year old and my 7 year old to take to school. Much easier to wash than straw bottles. And the locking mechanism ensure that there are no accidental spills in their knapsacks. This is a great water bottle for kids (4+). It's a little tricky for my 3yr old to snap closed. Very easy to clean - no straws or tiny holes to deal with! Great size for my toddler. She's able to open and close it on her own. Doesn't look like it is sealed when closed but it doesn't leak so happy about that. It is easy to carry cause of handle and not difficult to clean. Highly recommend for any toddler that is able to drink from a cup.